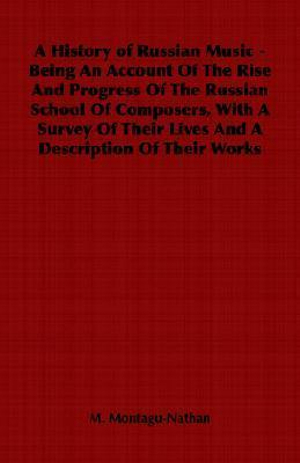 M. Montagu-Nathan takes an in-depth look and the history of Russian music, and a special look at the rise and progress of the Russian School of Composers. Contents include: Introduction; Part 1- The Pre-nationalists. Volkoff- Berezovsky, Bortniansky and Verstovsky, Glinka "A Life for the Czar," Russian and Ludmilla, Dargomijsky, The Stone Guest and the Five, Seroff and Lvoff. Part 2 - The Nationalists. 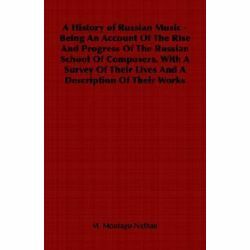 Balakireff, Cesar cui, Borodin, Moussorgsky, Boris Goudounoff, Khovantchina, The Last Phase, Rimsky Korsakoff. Part 3- The Decline of Nationalism. Glazounoff, Liadoff and Liapounoff, Arensky, Tchaikovsky Rubinstein and the Eclectics, Taneieff. Part 4- The Present Movement. Rachmaninoff, Gliere and Ippolitoff-Ivanoff, Scriabin, Vassilenko and Grechaninoff, Akimenko Tcherepnin and Rebikoff, Steinberg Medtner and Catoire, Stravinsky, Operatic and Concert Enterprises, Appendix I, Appendix II.